This isn’t a new brewery – quite the opposite, really, as it’s a brand being used by the oldest brewer in the UK. And it’s not even a new brand, as it was a title Shepherd Neame started using a couple of hundred years ago when being steam powered was all very new and modern. 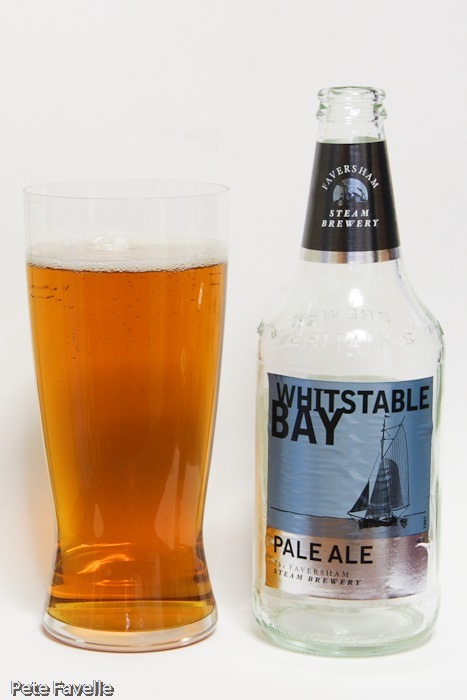 It gets more confusing, because on Shepherd Neame’s own website the beers are primarily labelled as the Whitstable Bay Collection – although they are all clearly under the Faversham Steam Brewery banner too. 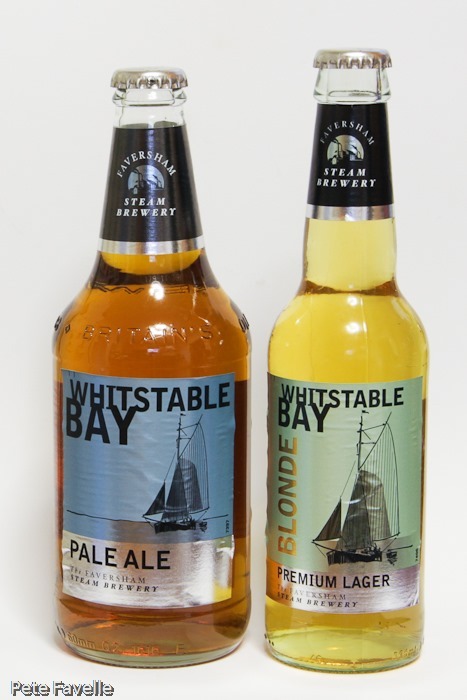 Here are two handsome bottles from the collection the Pale Ale and Blonde Lager; the third beer in the collection is the Whitstable Bay Organic Ale – which has been part of the main Shepherd Neame range for some time – and the range is set to grow over the next few months. Let me say that I love the branding; a big departure from the normal style used by the brewery, and the clear glass and crisp graphics are clearly aiming away from the traditional beer market. The Pale Ale is a rich golden 4.0% ABV ale; it looks good in the glass, although the head is thin and fleeting. The nose is malty and with the iron tang characteristic of the brewery. Alongside is a sweet, light citrus fruit – more tangerine than orange. In the mouth, it’s notably fizzy – more than I would prefer. The start is a nicely sweet caramel, with a fresh, green fruit edge quickly yielding to a dry but fleeting bitter finish. 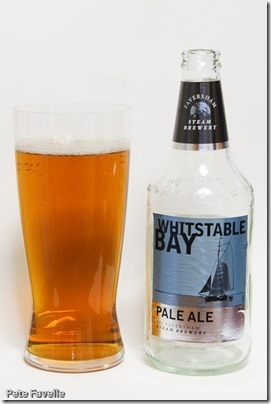 It’s a nice, pale Kentish ale that puts me in mind of a crisp autumn day. 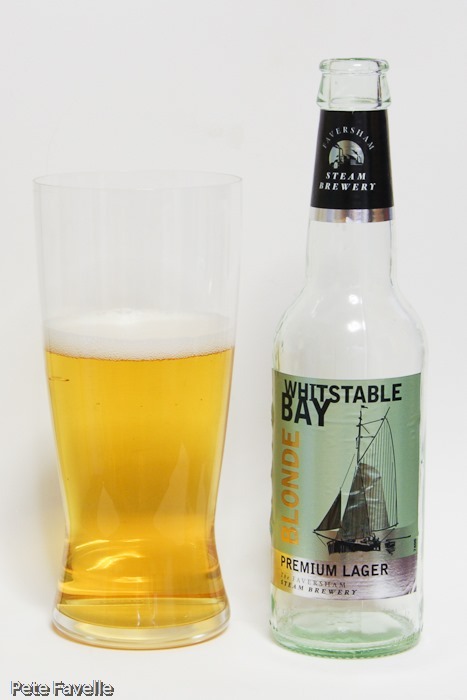 The Blonde Lager is slightly stronger at 4.5% ABV and comes in a more ‘lagery’ 330ml bottle. A beautiful pale straw colour in the glass, with a similarly lacklustre head on it – but that’s more in line with a lager. The nose is more complex than you might expect; a nice leafy hop aroma, blending with a slightly toasted sweetness. In the mouth, it’s not overly sweet but is well rounded, with a definite red fruit hint lurking. I have to confess that I’m not a huge lager fan, but this is a pretty decent example, and certainly brings some complexity to the table – something, no doubt, to lure the unsuspecting lager fiend into ‘proper’ beer! 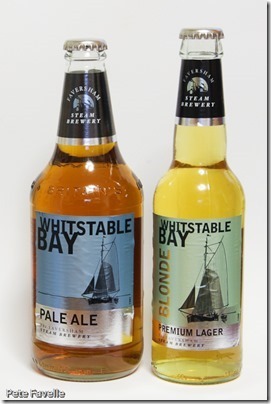 Sadly, despite the revivial of the Faversham Steam Brewery name, these beers were made without the use of a steam engine. But they’re tasty enough that I’ll forgive them. Many thanks to the folks at Shepherd Neame for sending these beers over to taste! Twigged it was Shepherd Neame when I looked closely at the bottle, “Britains oldest brewer 1698” raised up on the glass. Not a bad drop mind, low power, a perfect session beer.